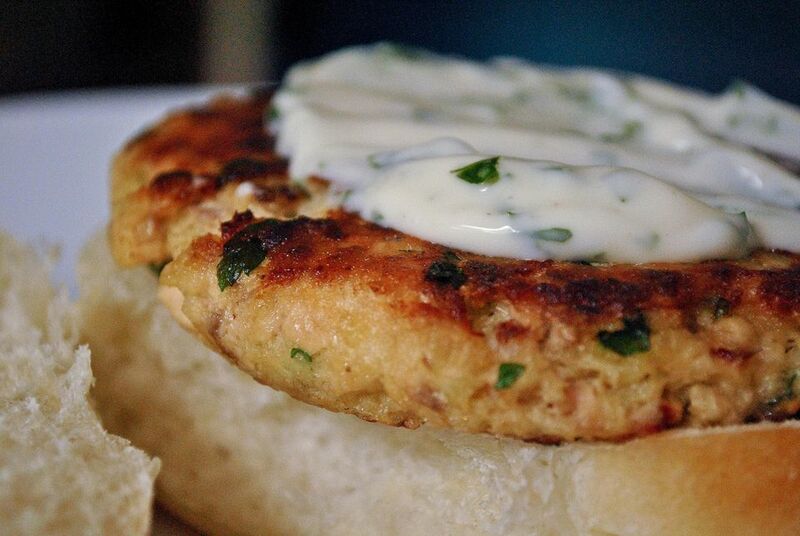 There's something about fish burgers that transports you to summer, even if it's cold outside! For this recipe we used halibut, but any firm, dense fish will do, such as cod, salmon or even tuna. The fish is coated in a tempura-like batter and then served on a toasted bun with homemade tartar sauce and a side of hand-cut potato chips. The tartar sauce is a simple mixture of Hellman's mayonnaise, diced cornichons (small gherkins), Spanish onion and capers. The chips are paper-thin slices of potato fried only for a few seconds. The result--crispy, salty chips-- the perfect accompaniment! First, prepare the tartar sauce. In a small bowl, mix together the mayonnaise, cornichons, onion, and capers. Set aside. Thinly slice the potatoes and place them on a paper towel to dry. Heat the oil on high heat in a medium saucepan. Place the potato slices into the oil and fry for about a minute or until golden brown and crispy. Remove with a slotted spoon and drain on paper towels. Make sure that you remove all of the chips from the oil before cooking the fish. In a mixing bowl, combine the flours, baking powder and water with a fork. Add the fish fillets and coat well. Gently lower the fish into the oil and fry about 3-4 minutes or until the batter is golden. Remove and drain on paper towels. Meanwhile, pop your buns in the oven and lightly toast them for a minute or so. Assemble the hamburgers, by spreading on a layer of tartar sauce, followed by mixed lettuce, a fish filet, a bit more sauce and then the bun top. Enjoy!